Modern Day Heroes. This is how we call our Overseas Filipino Workers (OFW) for so many reasons. They have great contributions to keep our economy afloat through strong remittance inflows to our country. Away from their loved ones; working hard abroad to make a better living; loneliness and homesickness; dealing with cultural differences; these are just some of the sacrifices that our fellow countrymen have to endure. Leaving their homeland in exchange to an opportunity to earn money and be able to provide their families the basic necessities. They toil everyday in foreign lands in hope for a brighter future. Everyone has their own inspiring stories. Their sufferings, may it be physical or emotional is truly priceless. 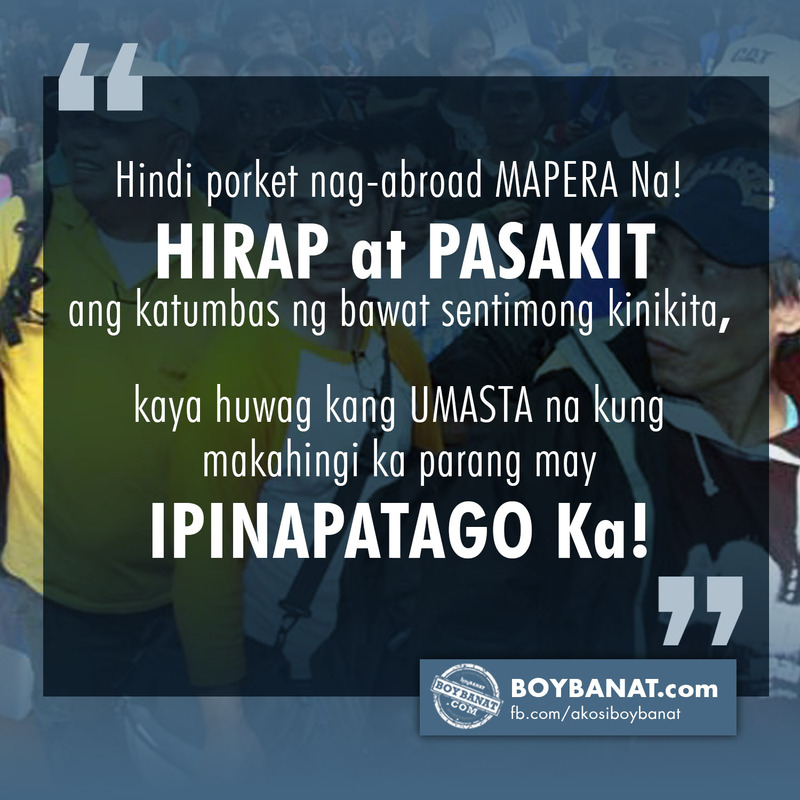 Being an OFW does not mean an instant or easy money. They really worked hard for it to give their families a better living. They bear the absence of their loved ones when they got home from long day of toiling. So think first before you ask money from an OFW as you never know the hardships they've gone thru to earn it. As far as I can see...That's how far I'd like to go. with a cheerful heart and full trust in the Lord. Whenever they learn that I work abroad, I know they think of me having a lot of money. What they don’t know is that I never enjoy my pay out because I have to send it right away to my loved ones. Most of the time, the only left for me is hope that everything will be fine soon. like the day & left all of you to work in another land. Unfortunately, few overseas workers tend to have an affair abroad as they long for their husbands or wives. They fell into temptation as they hardly can’t resist their manly needs. Loneliness has consumed them so they had sought for someone to fill the absence of their partners. But most of such affairs had lead to having another family while abroad. In my homeland, my wage is enough. I try to work abroad so I can earn more money to give to my family with almost nothing left in my pocket. But sometimes I can’t understand why no matter how much I gave them, they still ask for more. Many people don’t know how hard to work away from home. You can’t sleep at night because you the thought about your family linger through your mind. You can’t see your children growing and how well they do. Sometimes, telephone calls can’t suffice the day you miss them. 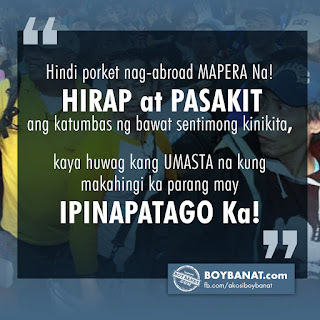 Being an OFW entails you to sacrifices. I gave up my precious time with my loved ones to take a chance of higher income abroad. The guilt of leaving them is in my heart. But whenever I think of it as an opportunity to give the best for them, I feel motivated. Do you have relatives working abroad? Send them warm regards. If you also have an inspiring message to share, feel free to Contact Us. 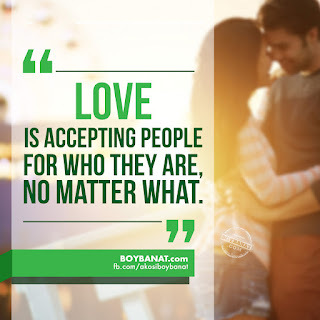 Here at www.boybanat.com, we value your thoughts and ideas. 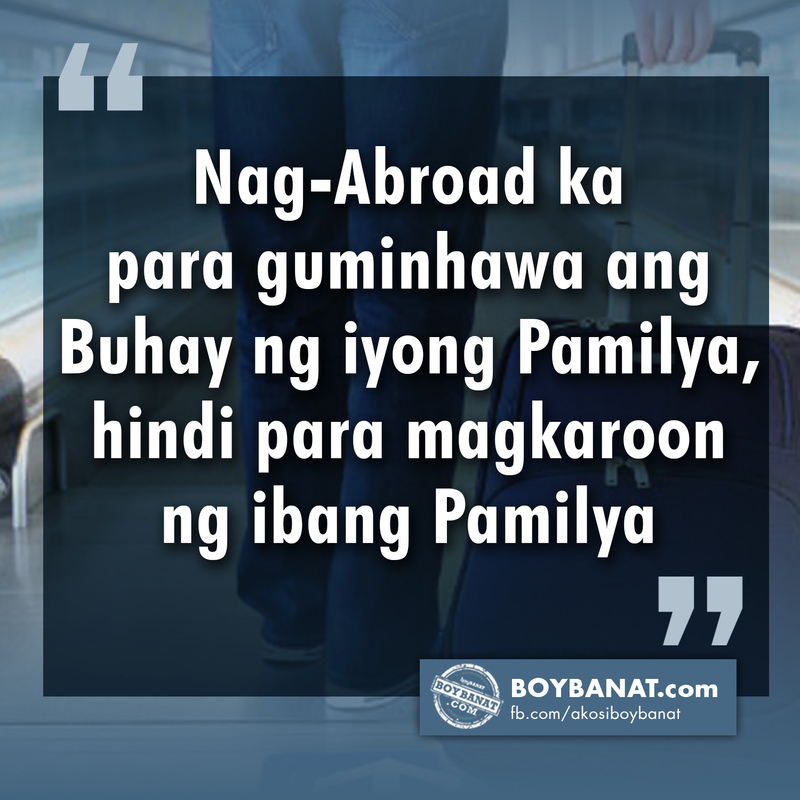 Share your own tagalog ofw quotes and keep posted with the latest features by visiting us again.